When I looked at the recipe references for Hinava, it immediately came to mind that it is very similar to something which I’d learnt in Spanish cooking. Ceviche (pronounced say-bee-CHAY) is a technique frequently used in the preparation of seafood in spanish tapas. 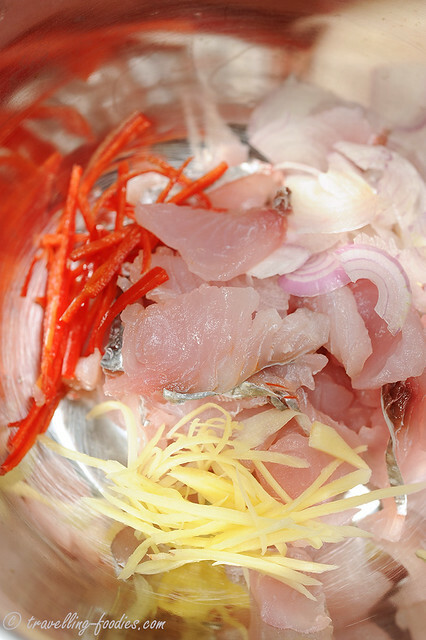 The seafood, are cured raw in a citric acid loaded marinade with limes and/or lemons. Other frequently added condiments include onions, chillies, tomatoes and coriander, i.e. the standard salsa protocol. It remains a very popular means of food preparation in Spain as well as spanish-influenced territories, i.e. South and Central Americas, especially in Peru and Chile. The technique is not only popular but also very old, whose culinary history speaks of differing tales, some leading back to the time of the flourishing of the Incas and arrival of the Spanish conquistadors while others date back almost to the time of Christ. And here we have, across the vast Pacific at the tip of Borneo where a very similar dish, Hinava that has found its place into the dietary habits of the tribal people of Kadazan and Dusun. The similarities are just too striking. 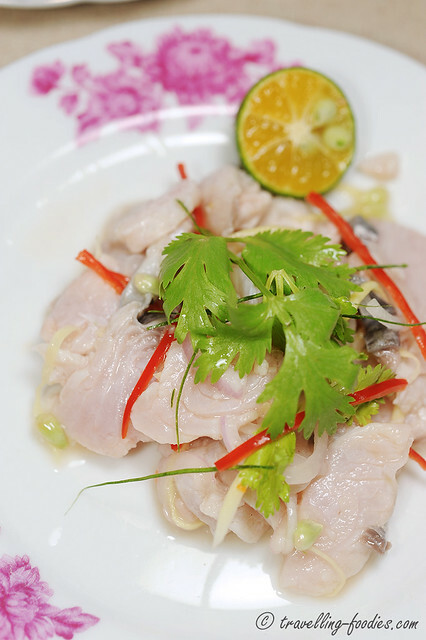 Ceviche works through the use of citrusy acridity on white meat i.e. fish, shrimp etc. The lowering of pH denatures the long and windy protein chains thus effectively altering their chemical structure. This produces the characteristic milky appeal of meats which had been subject to Ceviche. The textures also change significantly, with the meats becoming considerably firmer. The opaque outlook together with the change in textural profile creates the false impression that the fish had been “cooked” by the acids when they have not. 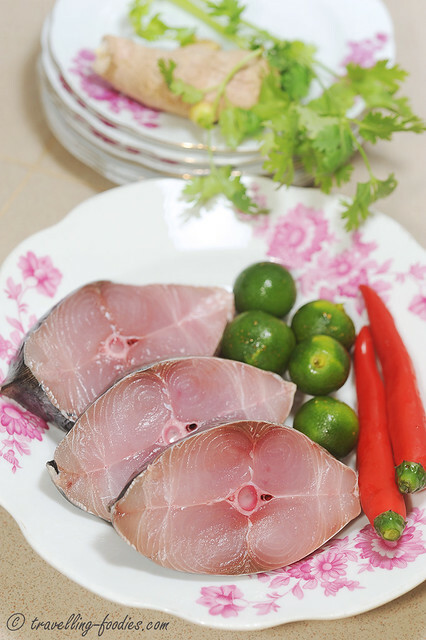 So do ensure that the freshest fish, with Spanish mackerel being the choice de facto, is used. And no, frozen fish doesn’t work no siree. 4-5 calamansi limes, halved and juice. 1. Wash and then slice the fish fillets thinly. 2. Add all the ingredients, except garnish, into a mixing bowl and give everything a quick toss. 3. Set aside for about 10 min, refrigerated. 4. Give the final mixture another quick toss, and plate. 5. Garnish with juilenned kaffir lime leaves, coriander and more fresh lime and serve as a salad/appetizer. Raw fish can be quite an acquired taste. Thankfully I like it enough to finish both servings prepared. As expected, the concoction is rather tapas like. I would have liked to douse it with a generous splosh of extra virgin olive oil and eat it with some spanish bread. Pan de Jamon maybe? But no I didn’t. Trying to keep the flavours as authentically Kadazan as possible. Unlike other food grade raw fish available at sushi delis, like tuna, salmon, sea bream, amberjack etc, mackerel is not commonly enjoyed raw. In fact, in Japanese cuisine, another mackerel variety is often brined and pickled immediately to make shime saba as mackerel meat tends to be less tolerable to heat, deteriorating rapidly and doesn’t store well. I must impress upon you the utmost importance of using very, very fresh fish. So do buy mackerel from a reputable seller who would be able to tell you with much certainty and honesty if the “catch of the day” is indeed fresh or not. I tend to like visiting the wet market for fish on a Tuesday morning when the fishmongers would have received a new batch of fish after the weekend. Hinava has to be prepared as soon as you get the fish home, much like how ceviche tapas delis are never opened past 4 pm as they would rather close than to sell something inedible. As with all raw meats and related produce, consumption by really young children, very old folks and pregnant mothers are generally not advisable. Ceviching does not effectively rid the fish of all the pathogens and parasites, so eat with caution! But this makes eating all the more a thrilling experience yeah?! This entry was posted on May 7, 2013 by Alan (travellingfoodies). 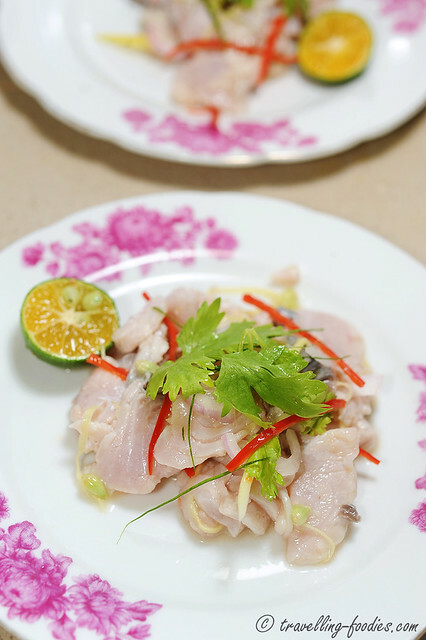 It was filed under Food, Simple Eats and was tagged with calamansi, ceviche, chili, cilantro, coriander, ginger, Hinava, limau katsuri, lime, mackerel, onions, raw fish, Sabah, shallots.